Honeymoon Offer – Stay at least 5 nights for your honeymoon and save upto 30% off the room rate. Please contact us for further details. Offers are subject to availability and terms & conditions apply. Price is per person based on 2 adults sharing a room. Prices are subject to availability. 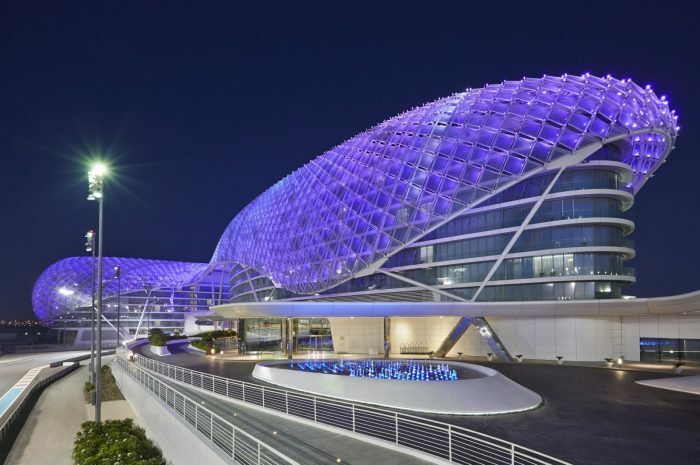 Yas Viceroy, Abu Dhabi has pinned excellence into a luxury hotel, consisting of grand foyers, vibrant colours and sleek architecture that is unrivalled on Yas Island. The gridded hotel is a masterpiece, built in the middle of the Abu Dhabi Formula 1 circuit making it an incredible once in a lifetime experience. Each guestroom is bold and contemporary in style; the interiors wave, emulating the F1 track and the floor to ceiling windows provide wonderful sights. The light airy rooms are not only comfortable but chic in style. The mood lighting and all-glass showers are great touches to each guestroom. Imagine dining at a restaurant next to the track or feel the vibrations of each race as they glide around the track and you sip on a cocktail or magnificent glass of wine. Such moments are spell binding. ESPA is a haven amidst the sounds and the sights of bliss. Signature treatments are absolute gems which must be enjoyed and a day relaxing by the pool makes for a hip and stylish place to hang out. Early Booking Offer – Book early and save up to 25% off the room rate. Honeymoon Offer – Stay at least 5 nights for your honeymoon and save upto 30% off the room rate. Contact us for more details about our latest amazing offers. Exceptional Service – With a 100% Service Rating on Feefo, we must be doing something right. Price Promise – Found it for less? Let us know, we love the challenge in beating prices. Exclusive Offers – Fancy a complimentary upgrade or free nights? Contact us for the latest offers. 100% Financial Protection – We are members of Travel Trust Association and an ATOL holder (T7483). Two infinity pools on the roof tops are great chill out areas, with plush sun loungers. A separate children’s pool’s is a great place for the younger Yas globetrotters to hang out. The fitness centre is fully equipped with state of the art techno gym’s and Kinesis equipment. Go for an early morning run or try some of the free weights before your day by the pool. ESPA is a sanctuary amongst this eye opening hotel, offering healing treatments that will refresh and invigorate you. Using massage oils to rejuvenate and eight serene treatment rooms to relax, this spa is heaven. The relaxation room overlooks the F1 circuit and you can laze the day away. Yas Viceroy, Abu Dhabi is a once in a lifetime experience for any honeymoon. The diamond panels that elegantly hang over the steel structure of the hotel create a veil of illusion which leaves all stunned. Luxury and opulence cover each stride of this hotel. Graceful, electric colours, fanciful centrepieces and lustrous finishes make Yas a fantastic hotel. Each guestroom is designed with comfort in mind, with buoyancy that is lively and energetic. Glossy and shiny finishes lend themselves to each open plan suite or guestroom and the floor to ceiling windows are a bonus. Enjoy an Arabian sunset at SkyLite, the rooftop bar which is an idyllic end to every evening at the Yas Viceroy or flop by the infinity pool and create glorious memories from your Abu Dhabi honeymoon. Dining indoor or outdoor, being serenaded by local live music or just relaxing in a corner as you effortlessly dine; you will be amazed by the variety of cuisine at Yas. Origins – this buffet provides an international menu which is great in taste and wonderful in flavour. An authentic tandoor and Rotisserie grace this restaurant and be sure to try some of the local speciality dishes. Kazu – Japanese dining at its finest. Teppanyaki, sushi, sashimi and a Robatayaki grill are just some of the heavenly bites offered here. The Sake expert will recommend sake that will compliment your each mouthful. Amici – Italian dining which is full of Mediterranean flavour. This intimate restaurant is an amorous affair. the meats and seafood just melt in your mouth. Noodle Box – Contemporary Asian cuisine is to be enjoyed with dim sum and laksa. Nautilus – Shucked oysters, Omani lobster and Gulf shrimp are just some of the seafood delicacies prepared at Nautilus. Yas Lounge – Terrines, sandwiches, pastries and cake and homemade chocolates are all served at this patisserie. Skylite – A relaxing rooftop hang where guests take in the dizzy heights of Abu Dhabi. We endeavour to ensure the information on our website is up to date. However, information about accommodation, resorts, activities, facilities and so on can often change. Therefore, please check for the latest information prior to any booking. Many of the flights and flight-inclusive holidays on this website are financially protected by the ATOL scheme. But ATOL protection does not apply to all holiday and travel services listed on this website. Please ask us to confirm what protection may apply to your booking. If you do not receive an ATOL Certificate then the booking will not be ATOL protected. If you do receive an ATOL Certificate but all the parts of your trip are not listed on it, those parts will not be ATOL protected. Please see our Booking Terms & Conditions for more information, or for more information about financial protection and the ATOL Certificate go to www.atol.org.uk/ATOLCertificate. Our ATOL Licence number is T7483.